Clam Lake Property Management LLC has a variety of vacation homes and cabin rentals from cozy lake cottages to secluded log homes set in the privacy of the forest and beautiful lakes in the Clam Lake, Wisconsin area of Northern Wisconsin. Please visit our web site to view virtual tours of our vacation rentals. Clam Lake, Wisconsin and our comfortable vacation rentals are only a scenic 30 mile drive from Hayward on Hwy 77, The Great Divide National Forest Scenic Byway, which passes through the heart of the Chequamegon National Forest, the home of Wisconsins original elk herd. Clam Lake is a true, four season Northwoods vacation destination. Some of the finest trails in the Midwest including cross country ski trails like the American Birkebeiner, Mukwonago and Rock Lake ski trails; CAMBA mountain bike trails; adventurous ATV/UTV trails; and fun, scenic snowmobile trails are located here. Clam Lake also has bars and restaurants, convenience store, gas station, snowmobile and ATV rentals, and bait and tackle shop. Clam Lake Property Managements vacation homes and cabin rentals range in size from cozy, 2 bedroom cabins to spacious 5 bedroom vacation homes. 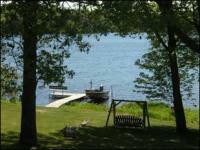 Many of our rental homes are located on Upper Clam Lake and Lower Clam Lake. These lakes are popular with fishermen and water enthusiasts alike. We also have homes and cabins in even more secluded locations like Buffalo Lake, Beaver Lake, Spider Lake (Ashland County), West Fork of the Chippewa River and a true wilderness escape on the Torch River.